After a lawsuit was filed on behalf of Ben by two concerned citizens, and following more than a year of court battles, a judge finally ruled in Ben's favor. PAWS co-founder Ed Stewart accompanied Ben on his FedEx-donated flight to California - cheerfully dubbed "Bear Force One" by the flight crew. Fall has arrived at ARK 2000, with short, sunny days and crisp, starry nights. Recent November rains promise new green grass, and many of the trees are showing beautiful fall colors. All of the bears seem to love fall weather, and Ben is no exception. 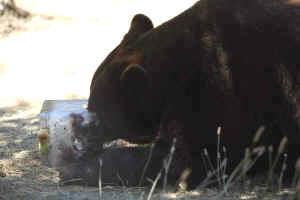 Bears are highly attuned to cues from nature, and both their behavior and biology change with the seasons. During the summer, Ben would nap under a shady tree during the hot part of the day, or take a refreshing swim in his pool. As fall arrives, the bears' appetites increase and they become more active, seeking extra food to put on a layer of fat for the winter. During winter, our bears don't truly hibernate but they do tend to be less active, eat less, and take longer naps inside their cozy dens. Ben enjoys a fresh fruit ice treat. We often see Ben contentedly grazing on green grass in the afternoon. Vegetation is a major part of wild bear diets, and it is wonderful to see Ben enjoying this natural food source that he was deprived of before he came to PAWS. At this time of the year, the oak trees drop their acorns and this is an absolute favorite treat for Ben and the other bears who spend many hours foraging through their spacious habitats for these nutritious treasures. Keepers also hide food treats creatively throughout the habitats on a daily basis, and the bears enjoy finding these hidden surprises. Ben's physical appearance has transformed since his arrival in the summer of 2012 from deplorable conditions in a North Carolina roadside zoo where he had spent six years living in a 12x22-foot chain-link and cement enclosure. His interaction with others was limited to being gawked at by visitors. His coat has now grown thick and lustrous, and he has developed muscle tone and strength. Years of incessant pacing and stereotypic behavior, caused by cramped confinement and deprivation, have given way to a range of normal bear behaviors which have blossomed since his arrival. Far too many bears are still held in inadequate conditions throughout the U.S., in need of help. Captive breeding produces a seemingly endless supply of cubs for roadside zoos, photo shoots, the pet trade, and the entertainment industry. Once these cubs are grown, many end up in substandard facilities such as "bear pits" where they suffer from poor nutrition, lack of veterinary care, and sensory deprivation. 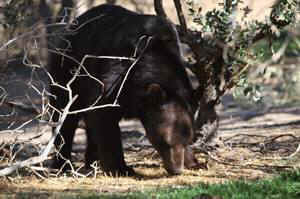 Food and general care for one healthy bear costs us approximately $20,000 per year ($385 per week, $55 per day). 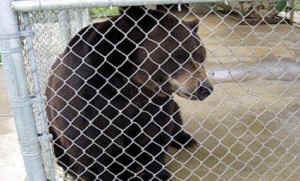 Please consider making a donation today to help PAWS care for Ben and the seven other bears living at our sanctuaries. Large or small, all donations matter. To become an adoptive parent to Ben, or to give an adoption as a gift, visit Performing Animal Welfare Society (PAWS).